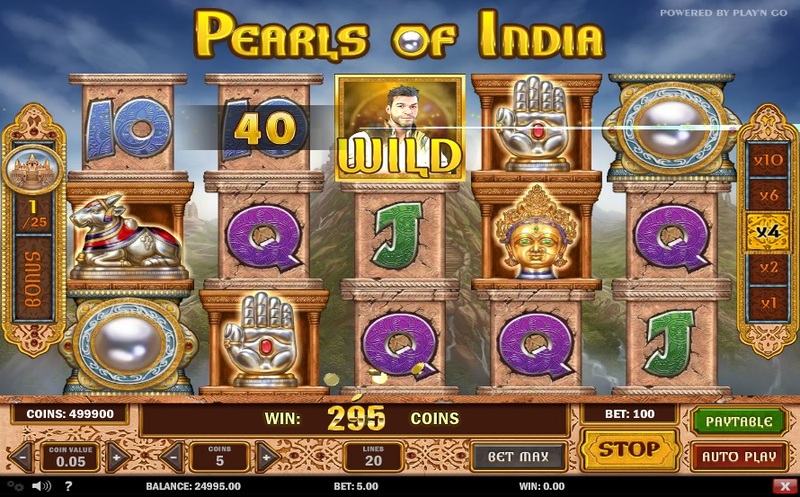 Pearls of India, an online video slot developed by PlayNGo as a sequel to its Aztec Idols, comes with a top jackpot of 750 coins along with free spins and increasing multipliers of up to x10. Since this 20-line slot is based on simple slots rules, it is incredibly easy to play. Players can bet up to 5 coins per payline and choose from coin values such as $0.01, $0.02, $0.05, $0.10, $0.20, $0.25, $0.50, and $1.00. The max bet for this slot is therefore $100 and the minimum bet is $0.20. Players can also use the slot’s Autoplay feature to spin the reels automatically. Players can also customize their gaming experience by turning the sound effects and ambience sound on or off. Pearls of India encourages players to join Riche Wild and find pearls in the mysterious land of India. Set against a beautiful Indian landscape, the slot gives players the feeling that they are in India. The reels feature symbols of Riche Wilde, Lord Ganesha, Temples, and Bulls, in addition to high-value card symbols. The slot has ambience music that can actually soothe players’ nerves as they play. The slot has a wild symbol in the form of Riche Wild, who can help players complete winning combinations by substituting for all other symbols on the reels except the scatter and the bonus symbols. The Pearl symbol is the scatter, but during the free spins round, it turns into a wild symbol. If players land five of these Pearl wild symbols along an active payline, they can win a prize of 1000 coins. The free spins round with 10 free spins gets activated as soon as players land three scatter Pearl symbols anywhere along the reels. The free spins feature can be re-activated during a free spin, enabling players to win as many as 1,000,000 coins. This is possible as the free spins are associated with multiplier values of up to x50. Temple symbols are collected as and when they appear on the screen. As soon as players collect 25 Temple symbols, the bonus feature gets activated. Players now have to choose from 3 challenges—the Statue of Vishnu, the Wheel of Brahma, and the Wall of Shiva. The Statue of Vishnu challenges players to select pearls, the Wall of Brahma challenges players to match three symbols on a wheel, and the Wall of Shiva challenges players to choose tiles on a temple wall and win prizes. Players can win as many as 250 coins here. The base game has multiplier values that can increase from x1 to x2, x4, x6, and x10 with every winning combination created. Pearls of India can be enjoyed for fun or real money at any online casino that offers PlayNGo games.